Dydra | What is Dydra? Handle any of this lately? Of course you have. Dydra is a cloud-based graph database. Whether you’re using existing social network APIs or want to build your own, Dydra treats your customers' social graph as exactly that. With Dydra, your data is natively stored as a property graph, directly representing the relationships in the underlying data. With Dydra, you access and update your data via an industry-standard query language specifically designed for graph processing, SPARQL. It’s easy to use and we provide a handy in-browser query editor to help you learn. SPARQL property pathns can make this even easier. 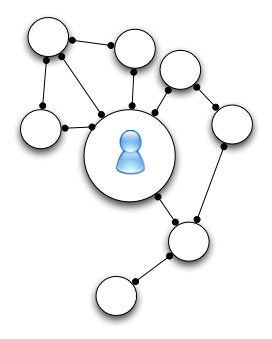 Dydra is built from the ground up to be performant for use cases built on graphs, like social networking. The performance benefits are impressive. You can use Dydra for lots of use cases, not just social networking. Lots of problems translate well to graphs; we have customers exploring everything from movie relationships to transaction logs. Dydra is a multi-tenant data store and query engine. You don’t need to estimate your data size, worry about clusters, nodes, resource use, or make big licensing commitments up front. And you’ll always be running the latest version of the platform. We manage every piece of the data store, including versioning, disaster recovery, performance, and more. You just use it. Dydra uses open standards recommended by the W3C. You can use Dydra from any programming language running on any platform on any device. All you need is an internet connection. And you own your data: it’s always yours to take with you in a number of formats. It’s easy to get started on Dydra. There’s no licensing, setup, or fees to start—just click and go. Go ahead, check out the quickstart.